We were recently interviewed for the LIVE HAPPilly newsletter all about Berlin, our life here as expats, and happiness. We thought we’d publish it here, as a nice introduction to us and to überlin. Look out for more moments of happiness as we share them on our Facebook page. James and Zoe, please introduce yourself! We’re a couple of English expats who left London nearly two years ago for a fresh start in Berlin. James is a writer and social media analyst, and Zoë is a fashion and streetstyle photographer, whose clients include Vogue, Harper’s Bazaar and Dolce & Gabbana. We run a blog called überlin, all about cool things to see and do in Berlin, the city’s music and fashion scenes, and living here as expats. 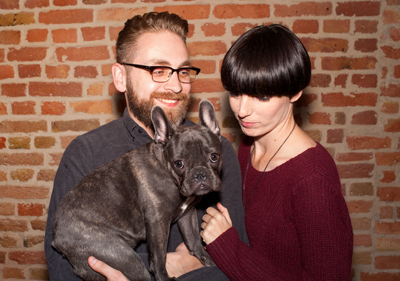 We live in Kreuzberg’s beautiful Graefekiez, with our two cats Iggy and Otis, and our French Bulldog puppy, Olive. Probably the same things that bring everyone else here: the (relatively) low cost of living and high quality of life, the space and openness (physical and psychological), the sense that change happens fast here, and the opportunities this offers. The city has changed a lot since we fell in love with it on our first visit six years ago, but our feelings towards it haven’t. Oh… and techno! What’s your definition of ”Happiness”? Happiness is the freedom to do what you want to do. Just moving to Berlin made us happy, because it allowed us to step off the career ladder and pursue work that fulfils us, spend the rest of our time exploring this wonderful city, and to meet like-minded people who are finding their own happiness. What does a ”HAPPilly Moment” mean to you? Our happiest moments always include some combination of the following: each other, our bikes, coffee, cake, sunshine (even if it’s cold), good food, good company and good music. Do you have a hint where our readers could enjoy a moment of happiness in Berlin? One of our favourite, and most quintessentially Berlin, places is Prinzessinnengarten. A community-built urban garden in the heart of Kreuzberg, it features a beautiful biergarten selling food made the produce grown there. If you like the sound of that, please sign a petition to protect the land on which Prinzessinnnengarten sits: see their website for more details. @Lingomedium: Give it a go! Interesting, thanks Alex. We’ll have to check this out. Wedding really is becoming the next Kreuzberg! I would like very much to migrate to Berlin for enjoying the place and the peace.